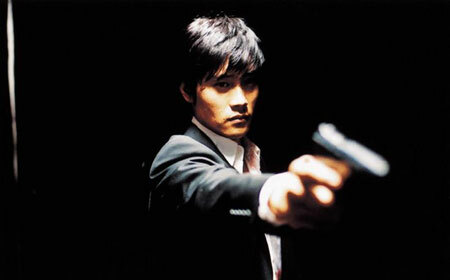 Lee Byung-Hun takes aim in A Bittersweet Life. The Skinny: Lee Byung-Hun plays a hard-boiled gangster who gets a glimpse of a better life in this stylish, ultra-violent, and strangely lyrical example of neo-noir from director Kim Jee-Woon. This breathtaking revenge fantasy may seem a bit hollow at times, but the poetic, heart-breaking finale justifies everything that precedes it. Simply put, it's an excellent film. Revenge has never looked as good as it does in A Bittersweet Life, a dazzling neo-noir gangster film from Kim Jee-Woon, director of The Foul King and A Tale of Two Sisters. Lee Byung-Hun, star of Everybody Has Secrets and Joint Security Area, takes on a new kind of role as Sun-Woo, a glum, impeccably dressed enforcer in the employ of a notorious gang leader named Kang (Kim Yeong-Chul). The plot kicks in when the boss asks Sun-Woo to watch over his mistress Hee-Soo (Sin Min-Ah, from Volcano High) to find out if she's having an affair. Sun-Woo's orders are clear: if he catches her cheating on Kang with another man, he is to contact Kang immediately or finish them off himself. However, when Sun-Woo discovers Hee-Soo with her boyfriend, he chooses to let both of them live. Unfortunately, this gesture of goodwill brings a world of pain onto Sun-Woo as the entire criminal organization sets its sights on punishing him for his act of "betrayal." Bloodied and beaten, Sun-Woo survives the ordeal, eventually embarking on a brutal, bloody trail of vengeance from which no one seems likely to survive. But the strange fact remains: Sun-Woo had been Kang's faithful servant for years, why would he suddenly have a change of heart now? Out of love? Or something more complicated? Blending the hardboiled cool of classic film noir with the hyper-stylized action of a John Woo film, A Bittersweet Life is a beautiful, wholly engaging cinematic experience. Before Sun-Woo decides to ignore his boss's orders we watch as he slowly comes to an epiphany. However, we're not quite privy to the depth of this realization until the final scene of the film, in which everything that has come before soon makes simple, perfect sense. Once Sun-Woo goes against Kang, the film becomes a visceral, balls-to-the-wall action film as the carnage comes full-force. As far as cinema revenge fantasies, it's not a stretch at all to say that A Bittersweet Life can stand alongside the best of them. As brutally violent as the film is, it's refreshing to know that the filmmakers retained their sense of humor. Interestingly enough, the film contains a variety of surprisingly comic moments interspersed throughout all the guts and gore. Oddly, A Bittersweet Life can be a remarkably funny film at times. Anchoring the entire picture is Lee Byung-Hun, who does a fine job inhabiting the role of the enforcer-turned-romantic-turned-unstoppable killing machine. Although Lee's winning good looks certainly add to Sun-Woo's character, he's more than just a pretty face. The actor brings a certain amount of depth to his anti-hero character, which is quite an achievement considering that a fully-realized characterization of Sun-Woo is hampered by the fact that his motivations must not be revealed until the film's ending. Even so, Lee does convey a sense of Sun-Woo's internal life, even if it is something not made readily apparent by the script itself.